Kelsey James had big dreams while living in a small town. 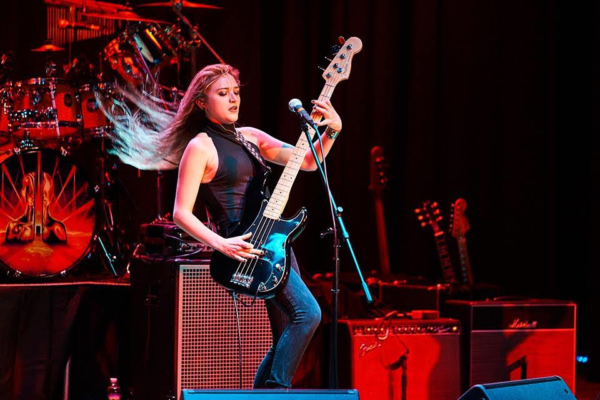 Despite always being the “odd one out” during her years in Southmoreland High School, James has found where she truly belongs: performing onstage with her own band, Shiva Skydriver. Shiva Skydriver began its origin story in 2008 and released its self titled debut album seven years later in 2015. In 2018, they released their second album entitled Let Go of All You Know. The band is comprised of lead singer and bass player James, her long-time friend and colleague, as well as guitar player/background vocalist, Ed Skero, and drummer, Luke Zajdel. James, a 2010 Southmoreland graduate, grew up listening to rock music and took a major interest in it at seven years old. Shortly after, she wished to learn the bass guitar since her favorite members of her favorite bands were usually the bass player. “I think that’s when I decided that I wanted to play in a rock band,” James said. A vital member of a rock band is its lead singer. There are an endless number of famous male rock singers that have scratched the face of history, but many have an extensive range that is not common among the typical male voice. James, despite never having an interest in singing, eventually picked up the position of the lead singer of Shiva Skydriver after experimenting and having a successful trial run. Ed Skero has worked with James from her first strums on the bass guitar to performing all across the globe with the band. James first met Skero while taking bass lessons off of him in 2006 and together have since performed over 800 shows together across the U.S. and Europe. He also worked alongside James to create Shiva Skydriver. Skero helps to write all of the the songs that the band performs: him taking on most of the musical melodies that happen in the songs and James writing all of the lyrics. “Creatively, he and I flow. We are both open to new ways of doing things and excited when something different it brought to the table,” James said. The powerhouse duo has become a trio, with Luke Zajdel recently being added into the band. James and the band’s very first drummer were the two main collaborators for the band’s name. Shiva is the name of the Hindu god of changing and destroying concepts. James, a high school student at the time, learned of Shiva in Mr. Chris Fabian’s world cultures class. Shiva was only half of the name, however. The piece that completed the puzzle of the name was given by their first drummer. Just as the name felt right to fit the band, music felt right in James’s life. The first musical instrument she picked up was the clarinet in 5th grade. Despite loving music and playing it, she didn’t always strive to practice and play when she had free time outside of school. In addition to the clarinet, James took drum and piano lessons outside of school. Despite not being fluent in either of the instruments, they immensely helped to expand her understanding of music. At 16, James started to play the six string guitar, which is the instrument that she plays at shows and writes a lot of songs with. In May 2018, Skero and James were invited to Leoben, Austria, near the capital, Vienna, Austria, to perform at a friend’s birthday party. The duo played a few different shows, did an interview and featured on the radio station, and a music presentation at their school. The trip caused them to meet a lot of people and to develop a following there, and they, including Zajdel, are “very excited” to return. Let Go of All You Know was released on December 21st at the Lamp Theatre in Irwin. This performance consisted of both albums being performed in their entirety, and is a favorite performance among all of the band members. According to James, the many themes of this album include “self reflection and self actualization, letting go of superstitions and opening yourself to what new things the universe has to offer.” James took many aspects from the works of Hermann Hesse and Kurt Vonnegut; she not only was writing the album while reading their works, but she also admired the way they portrayed big picture ideas in simple and easily-digestible ways. James has also recently been listening to more music from the nineties, such as the band The Smashing Pumpkins and songs by Alanis Morissette, which has taken her writing in a different direction than previously. Despite the students not supporting James, there were teachers that encouraged her individuality and interests. Mr. Fabian and Mrs. Lindsay DiCasolo, a former SHS teacher, came to see the band perform live, and James is immensely grateful for their support. “It was always a great feeling for me to have them in the audience,” James said. In addition to the aforementioned teachers, Mr. Evan Crissman shared a love for the band Motley Cure, and took her to see them in concert, which was the very first time she was able to see the band perform up close. Mr. Chuck Brittain also noted that her differences “would someday be celebrated” and that she should maintain her individuality. In high school, James didn’t fit in with any specific group when it came to musical tastes. Her style of music wasn’t popular at the time, so many weren’t interested in it. There were times where she was even picked on for her music tastes, but she didn’t allow that to extinguish her fire. The band will embark on their Time Travel Tour later this year. Tour locations include various cities across Austria, such as Graz, Leoben, and Trofaiach’s Annual City Festival. What a well written article. Very interesting with a great flow. Thank you for not only sharing interesting information about a former alumni, but in also putting out there the positive inspiration from her to the current students who will read your article. Thank you.